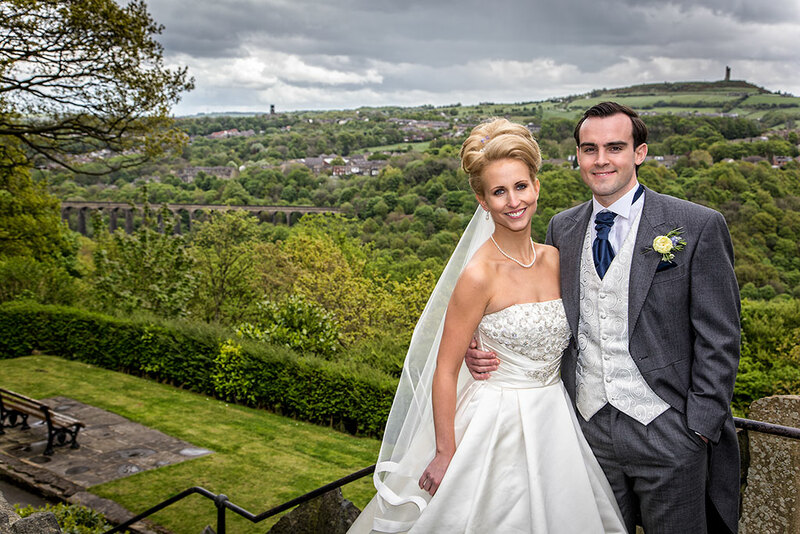 Jo & Matt had travelled from their home in London to be married in Yorkshire. 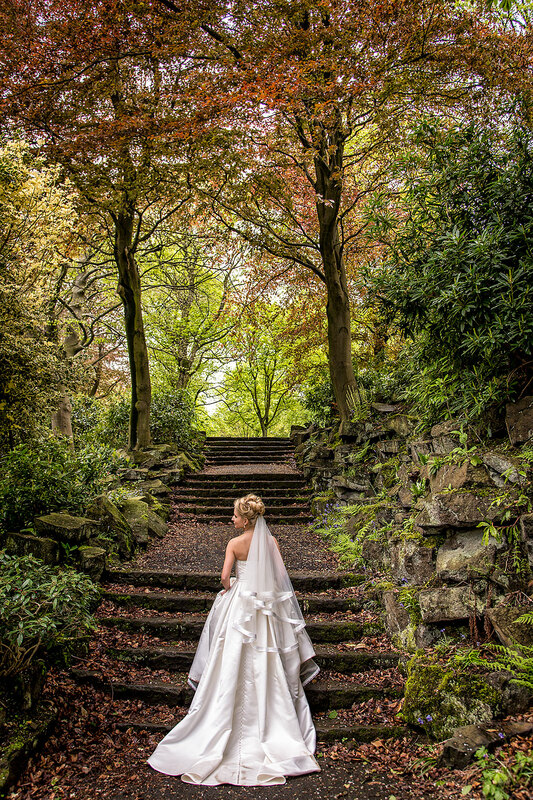 A pretty church in Armitage Bridge followed by a wedding reception at The Huntsman high up in the hills over Holmfirth was the order of the day. 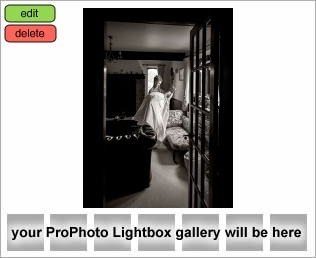 Jo was in the final stages of bridal prep when we arrived and was looking happy and relaxed and absolutely stunning. The bridesmaids were also looking gorgeous in their long chiffon blue dresses, and were all ready and enjoying a final glass of bubbly. A few fun photos with the bride and it was time for the waiting wedding cars to whisk them away to church. We were hot on their heels, and ready for Jo’s arrival. Brollies were needed to shelter our lovely bride from the rain, but once inside the church the awful weather was soon forgotten about. After a lovely ceremony, the bride and groom exited the church to a lovely shower of confetti all beautifully presented in sheet music cones which had been hand made by Jo’s mum June. A fabulous red vintage bus was waiting outside the church ready to transport the guests to the reception. 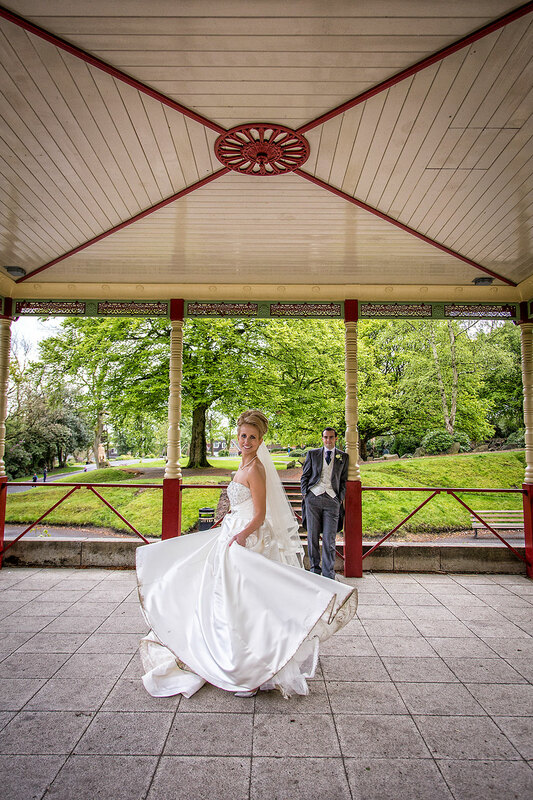 With as much haste as possible we departed from Church and headed for Beaumont Park for our bride and groom’s personal photography time. With just a hint of good luck, the rain had stopped and we were able to capture some beautiful shots of our happy couple in this lovely setting. Time to head on to the wedding breakfast and just in the nick of time... torrential rain! Family and guests were happily eating canapés and drinking champagne whilst awaiting the arrival of Jo & Matt. So with most of the photography completed they were able to spend lots of time chatting with their guests before dinner was served. A lovely wedding breakfast was enjoyed and with a slight twist on tradition the speeches were made in between each course. The evening guests were soon arriving and the evening celebrations were ready to begin. So with cameras at the ready it was time to cut the cake. The live band introduced the first dance as Matt took his bride for their ultimate first dance together.